« REGISTER NOW! It’s Time > Trapp+Holbrook New Westminster Condos by The Salient Group > Starting from just $219,900 > Modern Living in Historic Neighbourhood > GET VIP ACCESS! SPECIAL PROMO ON NOW at The Residences at WEST Vancouver False Creek Condos > 10% interest on Purchasers Deposits until Completion! Great News! 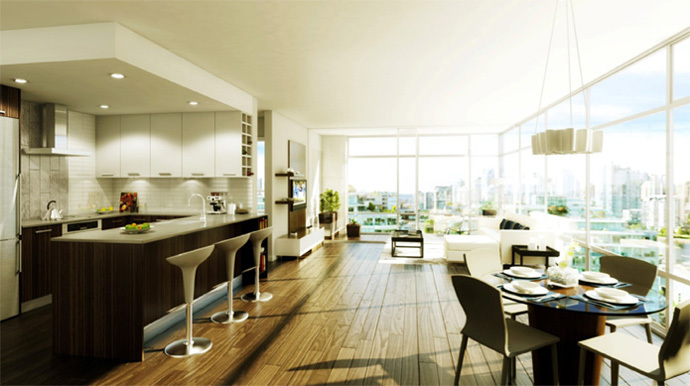 The Residences at WEST in the Southeast False Creek Vancouver district are now 70% SOLD OUT! However, this doesn’t mean that you’ve missed out on this ground level opportunity to own at this amazing Executive Group Development project! The Residences at WEST False Creek Vancouver condos are now offering 10% INTEREST on purchasers deposits until completion! This SPECIAL PROMO is only for a limited time until December 1st, 2012 -OR- the first 20 sales. As of beginning of November, 8 lucky homebuyers have already taken advantage of this special 10% Interest Promo, leaving only 12 more homes that are eligible for this incentive. On a typical 2 bedroom around $600k at The Residences at WEST False Creek Vancouver condos, the interest earned would be $18,000 – $20,000 which is given as a credit and reduced from the purchase price! On the smaller homes, the interest would be $7500+. Please contact Craig Anderson, Director of Real Estate Marketing and Sales at the Executive Group of Companies for more details at 604-377-5220 or craig@liveatwest.com. Brought to you by master builder Executive Group Development, the new False Creek Vancouver Residences at WEST Condos will feature an exciting project that will change the face of this neighbourhood forever. With a landmark location, iconic design and unequalled value, The Residences at WEST Vancouver False Creek condos for sale will feature over 100 Homes between the price point of $268,900 to $459,900, making them extremely affordable for the South East False Creek neighbourhood. The developer is now introducing the new False Creek Vancouver Residences at WEST Condos, which will become the most highly anticipated and exciting project in this neighbourhood in 2012! This is a PHASED DEVELOPMENT that will see the construction of a master planned mixed use community that will be eventually home to over 43,000 square feet of prime retail/commercial space at ground level that will include retail services, banks, restaurants and stores. The Residences at WEST Vancouver False Creek condos by Executive Group Development developers will be poised to become the natural heart and epicentre of The Village and surrounding False Creek neighbourhoods. WEST Vancouver False Creek tower is an opportunity to own in Vancouver’s best new West Side location at a price that may never be seen again! You can find more details online at www.liveatwest.com and if you are not represented by an agent (i.e. you DO NOT have a realtor), you can register with us and we will not only provide you with the latest VIP info and updates about The Residences at WEST Vancouver False Creek, but we will also find a suitable professional realtor to help you find the home of your dreams. Coming SPRING 2012! The presentation centre will have a fully finished 2 bedroom suite! > Amenities at The Residences at WEST False Creek = technology lounge, fitness gym and new daycare facility! ALL SUITES COME WITH PARKING! Wow, this is a first in the Vancouver real estate market! All homes at the Residences at WEST False Creek include parking! So no extra costs or ‘optional upgrades’ here … underground secured parking is included in the price! WEST False Creek condos is one of the best new developments in the Vancouver West Side market that is within walking distance to major retail, The Village at False Creek, the seawall and waterfront. It’s a vibrant new neighbourhood that is fast becoming the destination of choice for urbanites as well as the investment choice for Vancouver condo buyers and investors. Just steps from Urban Fare, the liquor store, Terra Breads and London Drugs that is opening this year, The Vancouver WEST False Creek condos are also very conveniently close to the Creekside Community Centre! There is immediate access to the Aquabus as well as the SkyTrain and there is a brand new daycare around the block! At the new Vancouver WEST False Creek condos, you will find a 16 and 15 storey tower joined by an impressive podium deck at West 2nd designed by Walter Franci Architects Inc. The interiors which are equally fabulous are designed by Atmosphere Interiors Vancouver, a local award wining team. In addition, the features and construction practises have followed LEED Silver equivalent design, which makes the building truly sustainable and eco-friendly. On site, the new False Creek WEST Vancouver condos will have a stunning entry as well as amenities that include a state of the art gym, lounge, and wi-fi. As mentioned, there is underground parking which is included with your purchase price! The windows are double insulated and the appliances inside are Energy Star rated. There are low flow showerheads and fixtures as well as an extensive green roof and landscaped amenity space. The new Vancouver WEST False Creek Residences will also feature a car share program for residents only as well as sustainable rain water catchment for self irrigation of the landscaping. The homes at the eco-friendly False Creek WEST Vancouver residences will also utilize low voc carpet, paint, sealants and adhesives. All of the amenity spaces and lobby in addition to the underground parking will be accessible by key fob security access. All homes at the Residences at WEST False Creek condos will also have in suite TV monitor systems, smoke detectors, sprinklers and access to a uniformed lobby attendant. We have been waiting for a list of the interior features here at WEST Residences in False Creek and here are some of the highlights that we’ve just found out about this project! The stylish interiors will have 8 foot ceiling heights with window walls that extend floor to ceiling in addition to a choice of pre-finished engineered hardwood flooring with sound attenuating underlay system. Also, the pre-construction False Creek Vancouver WEST Residences will feature slender interior doors, uniform height exterior doors, patio doors and interior doors and shelving with chrome coat rod in all closets including the walk-ins. Other interior features at the new False Creek Vancouver WEST Residences include stacked Blomberg washer and dryer, work spaces, frosted full height sliding glass divider in the dens and junior one bedroom suites and flat profile baseboards. The suites have electric baseboard heating too. The ensuite and bathroom at the pre-construction False Creek Vancouver WEST Residences will feature custom medicine cabinetry, deep drawers, glass walk in closets and polished chrome faucets in addition to high efficiency dual flush toilets, ceramic wall tile, deep soaker tub and porcelain tiled flooring. The bathrooms and ensuites at the new Vancouver WEST False Creek Residences will also feature matching chrome bath accessories and textured wood grain laminate vanity and countertop with contemporary surfaces. The entertainment areas and kitchen spaces at the preconstruction False Creek Vancouver WEST Residences will feature Euro stainless steel fridge, wall oven, ceramic electric cook-top, integrated dishwasher, designer chimney style hood fan and built in microwave. Also presented at the False Creek Vancouver WEST Residences for sale include quartz counter tops with Carara marble backsplashes in addition to under mount stainless steel sink, pull down faucet, garbage disposal and textured wood grain laminate cabinets with modern pulls. 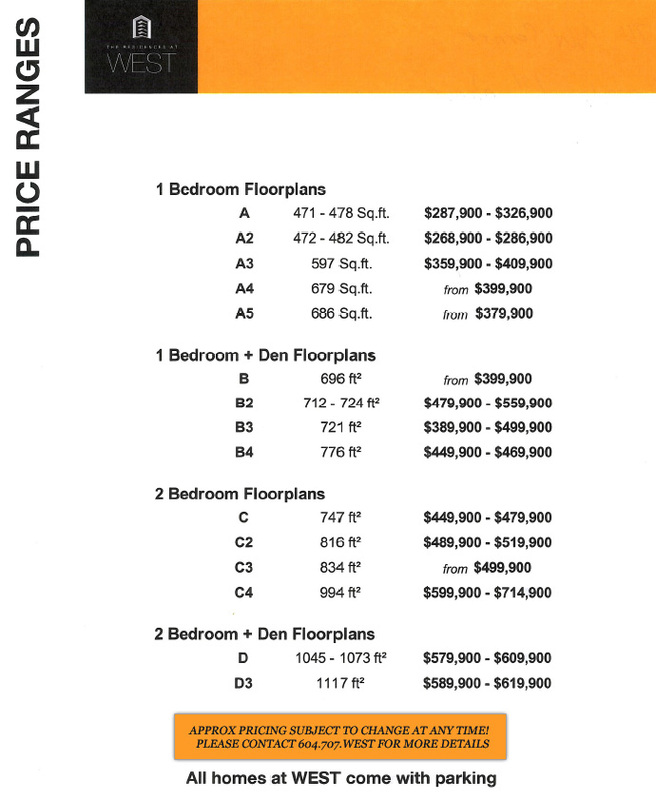 As indicated in the pricing chart (which is a draft and subject to change at any time. 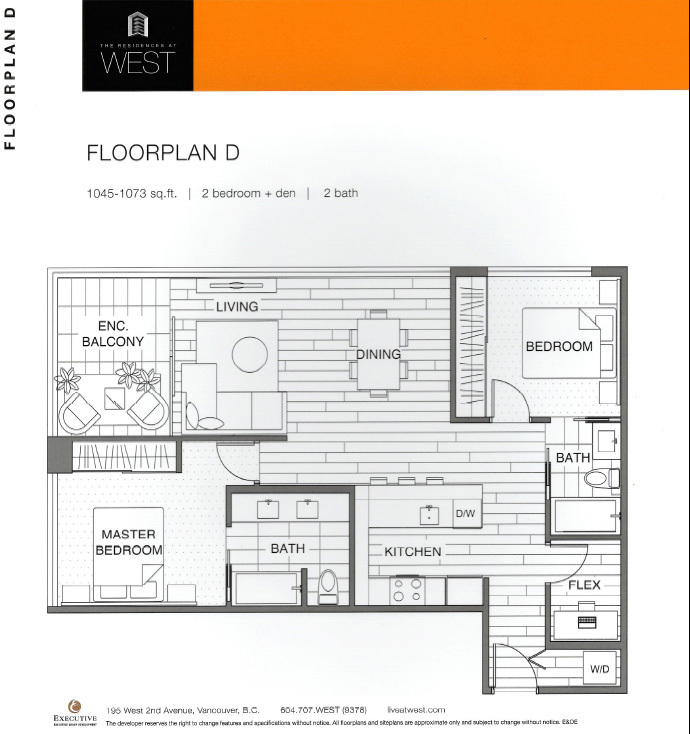 Please contact the WEST False Creek sales team for more information and updates), the 1 bedroom floor plans at the Residences at WEST False Creek condos start from 471 square feet and $287,900 with the largest A5 plan starting from 686 square feet and from $379,900. 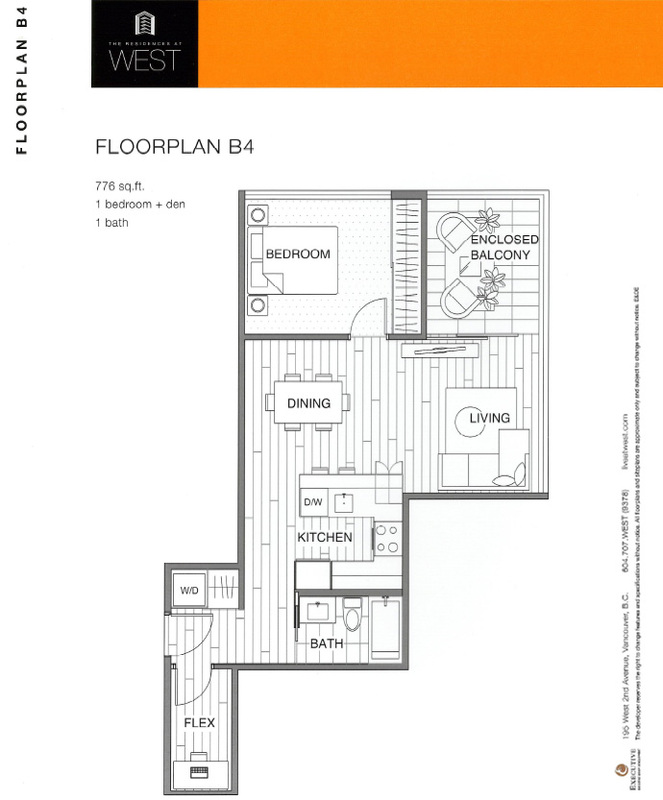 The 1 bedroom plus den Vancouver WEST Floor Plans in False Creek start from 696 square feet (layout B from $399,900) to the largest B4 layout which is from $449,900. 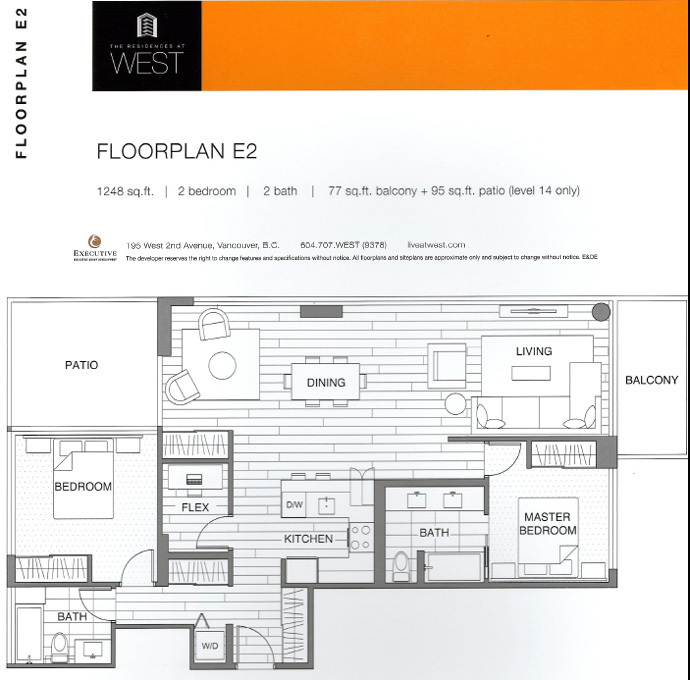 The very spacious 2 bedroom floorplans at WEST Vancouver False Creek Residences start from 747 square feet from $449,900 as well as the largest C4 plan from 994 square footage and with starting price point from $599,900 (great value!). 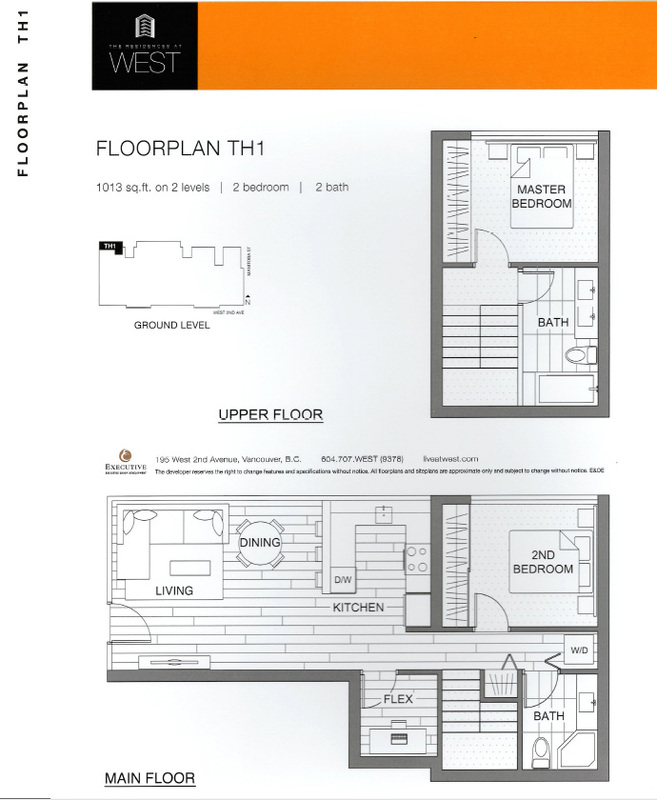 The largest plans are the 2 bedroom plus den Residences at WEST floor plans that includes D between 1045 to 1073 square feet from $579,900 as well as D3 Layout at 1117 square footage and priced from $589,900 to $619,900. All in all, the new Vancouver WEST False Creek Residences are GREAT VALUE. As mentioned above, the development and design team offering the Vancouver False Creek WEST Residences includes the Executive Group Development builders and Walter Francl Architecture Inc. Located in Southeast False Creek, the Vancouver WEST Residences will be a phased development that will include a podium deck plus 2 high-rise residential buildings at 15 and 16 storeys in height. The architecturally significant landmark towers at the new Vancouver False Creek WEST Residences will be very modern and design savvy and will be built to LEED Silver equivalent features. The expected completion date is for Late 2014 and it is currently in the pre-construction phase. The Southeast False Creek Vancouver WEST Residences will include up to 488 market units for sale that will range from 1 bed to 2 bedroom plus den floor plans. There will be over one hundred homes between the price point of the mid $200’s to mid $400’s and all forms of HST Rebates and new home buyers’ rebates are applicable. All new homes at the Vancouver False Creek WEST Residences by Executive Group Development will come with the standard home warranty. In addition, the amenities on site at WEST False Creek Vancouver condo towers will include a beautiful new gym, tech lounge as well as a daycare facility that will have room for 69 children. The interiors at the new False Creek Vancouver WEST Residences will include quartz engineered counters (very high-end) as well as European appliance sets from Blomberg and Fulgor. There are floor to ceiling windows in addition to custom millwork throughout the homes. Due to the nature and location, many of the False Creek Vancouver WEST Residences will also have great views and a close proximity to the waterfront and to the Village at False Creek. Over the last few months we have been working with our Architects to finalize floor-plans and prepare the Residences at WEST Vancouver Condo Sales Center for opening later this month. We promised to keep you updated with the latest information and earlier today, we received two important items we knew would interest you here at the False Creek Vancouver Residences at WEST condo tower. With over 100 – 1 Bdrm, 1 Bdrm+Den and 2 Bdrm Residences at WEST Vancouver False Creek homes from $268,900 to $459,900, 43,000 square feet of street level shops & restaurants, 69 child Daycare facility and convenient access to 2 SkyTrain lines, WEST False Creek Vancouver condos is set to be Southeast False Creek real estate’s best new address.…and offer prices that may never be seen again! You have seen the iconic exterior of WEST False Creek Vancouver condo tower though we wanted to give you a sneak peak of how our interiors will look. Atmosphere Interiors has been working behind the scenes to create the perfect balance of modern elegance and comfortable, casual living for the homes at WEST Vancouver False Creek condo tower. We could go on and on about the features and finishes of our interiors though a picture is worth a thousand words. Whether you are a first time condo buyer, moving up the property ladder or looking for an exceptional investment opportunity, our 5-5-5 deposit structure makes owning a home at WEST False Creek Vancouver condos – just that simple! With an initial deposit of 5% and two further deposits of 5%, 3 months and 9 months after purchasing, securing your home at WEST False Creek Vancouver condos for sale simply means you don’t have to put out a lot of money. We are putting the final touches on the Vancouver WEST False Creek Condo Sales Centre and Display home with completion expected later this month. We look forward to introducing you to WEST – Southeast False Creek Vancouver real estate’s best location, design and value. 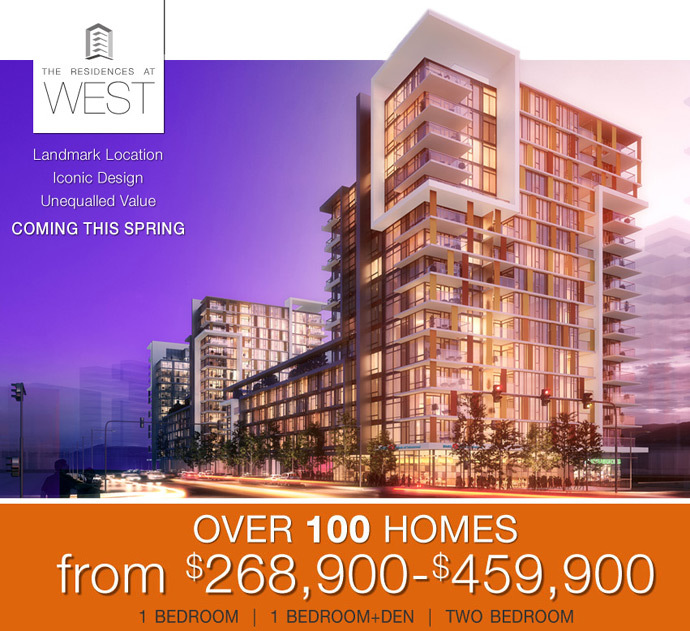 Visit LiveAtWest.com for more details or call 604-707-9378 today to register your interest with the False Creek WEST Vancouver condo sales centre! With more than 40,000 square feet of prime retail and commercial space being built out as part of the phased project at The Residences at WEST Vancouver False Creek condos, home owners will also be very close to boutique stores, grocery stores, banks, services and big box retailers around the area. Ultimately, the 2 to 3 phased project at The Residences at WEST Vancouver condos will feature the entire redevelopment of a city block between Columbia and Manitoba along West 2nd Avenue Vancouver BC. This ambitious project will be situated nearby the Village in Southeast False Creek, which is also close to the SkyTrain Line for easy transit. The premium location of The Residences at WEST Vancouver condos makes it a very pedestrian and transit friendly neighbourhood (which also features the Aquabus and the boardwalk seawall that connects to Granville Island and around the bend to downtown Vancouver and the arena area). In addition, the Vancouver False Creek WEST Residences will be very close to the Cambie Street Bridge that gives you easy access to downtown. For the same sized suite in other Southeast False Creek condo development homebuyers are looking at more than a $20,000 to $50,000 premium. Therefore, the Residences at WEST Vancouver False Creek condos are the most affordably priced development in this up and coming neighbourhood in the West Side. This information was originally published on the Executive Group Development website explaining their proposal for the West 2nd Avenue redevelopment plans to the city. Executive’s False Creek Vancouver real estate development calls for a mixed use project that will feature a unique and rare project in Vancouver’s most desirable West Side location. The timeless multi-tower mixed use residential development will be home to over 500 residences and retailers. The waterfront community of WEST False Creek Vancouver condos will command spectacular views and elegant architectural and interior design. Executive Group Development is planning False Creek’s most highly anticipated project with the largest contingent of vibrant retail space in the neighbourhood and occupying the premier location at Manitoba and Columbia Streets near the Southeast False Creek waterfront area. The original proposal in December 2010 highlighted the project that consisted of 3 condo towers beside the Olympic Village. To our understanding, the final approved project at The Residences at WEST False Creek Vancouver includes 2 towers plus a podium deck. The project, which covers the entire 100-block of West 2nd Avenue in False Creek, will house 500 boutique-style residences atop a 40,000-square-foot retail plaza. In addition, the proposal by Executive Group Development was the construction and design of a beautiful LEED Gold children’s daycare. We know that the daycare facility for 69 children was passed, but not sure about the LEED certification at this point. Francl Architects is designing the towers at Vancouver False Creek WEST Residences.